76 / the tasting panel / march 2015 Roots BRAND PROFILE W ho could forget the joy of an ice-cold root beer grow- ing up? Sweet scents of sassafras and sarsaparilla root soaked your taste buds as bubbles from the foam leapt playfully from the bottle and tickled your nose, leaving you refreshed, cooled and eagerly anticipating your next sip . . . nostalgia at its finest. The exact nostalgia that Founders 49, a division of LeVecke Corporation, hoped and succeeded in capturing when developing their brand, Uncle Bob's Root Beer Whiskey—a flavored spirit that embodies the vintage yet thoroughly modern lifestyle that speaks to Millennials' wants and needs. 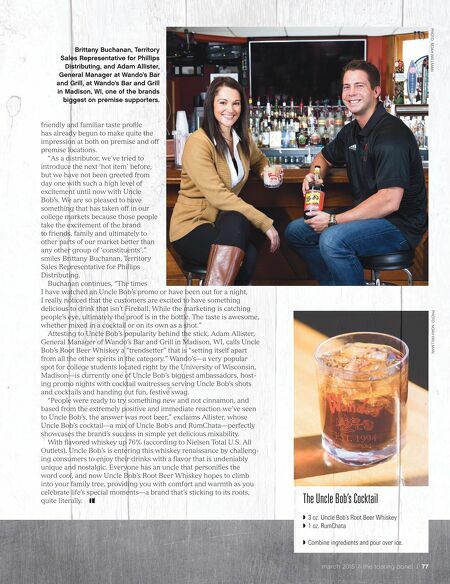 "Our goal was to produce a great tasting whiskey, while captur- ing Uncle Bob's passion for culture and providing consumers with unforgettable experiences to share with friends and family," says Melissa Venglass, Director of Marketing and New Product Development for Founders 49 and LeVecke Corporation. The end result is a unique spirit that's bursting into the ever-expanding flavored whiskey category with ambition and purpose. "We wanted to create a flavor and a product that stands out from the rest. Root beer is a flavor that is familiar to most people and that pairs really well with whiskey," adds Venglass. A whiskey that's aged in oak barrels and packs a punch at 70 proof, Uncle Bob's is classic and smooth—much like its vintage packaging. It delivers a complex medley of sarsaparilla and anise, balanced by the perfect level of sweetness. The root beer finish is long and lingering, reminiscent of your favorite root beer soda. 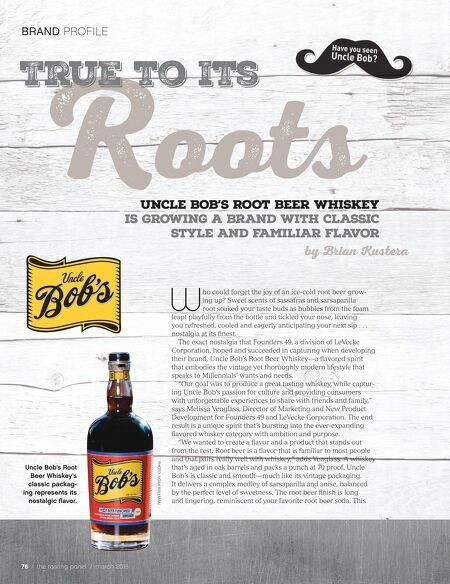 This True to Its UNCLE BOB'S ROOT BEER WHISKEY IS GROWING A BRAND WITH CLASSIC STYLE AND FAMILIAR FLAVOR by Brian Kustera PHOTO: NOAH WILLMAN Uncle Bob's Root Beer Whiskey's classic packag- ing represents its nostalgic flavor.